Summer is here and that means attending festivals, weddings and spending lots of time with family and friends. It also means a time to wear bright colours and feel fresh and alive. While sunlight can make you feel happier in general, having a tan can make you look thinner and more toned. Maybe it is psychological but statistics have shown that people feel more confident with a tan. It adds a warm glow to the skin, masks blemishes, and helps make colourful clothes stand out. For me having a tan makes me feel confident, healthier and happier. From previous blog posts you will know that I like to protect my skin from the sun so the safest and easiest way to have that golden glow is to apply fake tan. Some people use a moisturiser that has a self tanning agent which builds up gradually over a number of days but for me I want results much quicker so an overnight tan is the answer. Getting the right fake tan and applying it properly is definitely something that needs a lot of practice. Last winter I started “Tan Thursday”. This was a distraction from study for my daughter doing state exams and we had a lot of fun on Thursday nights trying out a number of products to brighten up bleak winter nights. It was also a great way of learning how to apply the tan especially when winter clothes covered the parts of the body we missed. Now we have it perfected and know exactly how to apply the tan properly for the summer months. 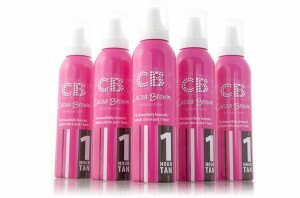 We tried a number of brands but the one that we loved the most has to be Cocoa Brown. While supporting Irish businesses is very important this product was the easiest to apply, cheap to purchase and you can find in most pharmacies and in Penney’s stores nationwide. The first few attempts did not go to plan. I missed big patches on my legs and I had no real method of applying it. I simply sprayed the product onto a mitt and started to rub it in anyway at all. Now after weeks of practice, I’m guaranteed a gorgeous sun-kissed colour with this amazing reasonably priced product which lasts for at least 3 to 4 days and looks the most natural I have ever tried. My 5 top tips on how to apply Cocoa Brown? 1. Shake and spray a small ball size onto the mitt or if you don’t have a mitt wear a plastic glove inside a fluffy sock and apply in CIRCULAR motions. 2. Imagine your leg in three parts, lower, middle and top. Then apply to each part, covering front, back, right and left of each part. Concentrate on where you have applied it or you will forget and if your like me you won’t remember and end up with streaks or patches. Always overlap the tan that you put on and remember you can never put on too little but you can easily apply too little. 3. I treat my arms the very same and do it in 4 parts (front, back, right and left) and ask a partner or house mate to do your back and other areas if you cant reach them. 4. Continue neck, chest and tummy concentrating on overlapping all parts. 5. I just wipe whatever is left on the mitt on my face but if you prefer you can add a small piece with your foundation and mix together instead. Once applied, it dries very fast so you can pop into a dark pyjamas, get a good sleep and set your alarm to have your shower first thing in the morning to wash it all off. You will be left with a very natural golden glow that you will love. This picture shows my legs with tan applied on one. Very natural look and I would highly recommend trying it. I would also like to thank the team at Cocoa Brown who sent me a little treat which one of my followers won recently for sharing my blog. So if you want to feel fantastic go and treat yourself to this product which you will get with a mitt for less than €10. It is money well spent and you will feel fantastic making your body and summer a lot brighter.